Black Duel, or 21 Duel Blackjack as it is also known is a modified form of standard blackjack, using common blackjack rules as well as enhanced features to appeal to new players or those that just fancy a change. Blackjack Duel is played with six decks and allows for a single hand to be played at any one time. Standard rules apply, however there is no Blackjack payout. Ace and ten count as a straight 21, the same as achieving 21 with three or more cards, this also means that the dealer may make a draw with your best hand. 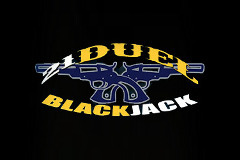 Blackjack Duel uses an optional side bet which may be activated prior to pressing ‘deal’. Select your stake on your blackjack hand, as well as placing an optional stake on the 2Up bet. Once you are happy, press deal to be dealt the cards. Two will be dealt to you, one face up, the other face down. Two more cards will be dealt to the dealer, both face down, and a further two cards will be dealt face up in the middle of the table. You now have the option to fold or play a middle card. Should you use one of the middle cards to enhance your hand, you will need to place an additional bet. The dealer will then choose one of the middle cards to play their hand, and any winnings will be paid accordingly. The optional 2Up side bet allows for the placing of a separate stake for the chance to win which is based on three cards; the two middle cards and your face up card. Any pair will pay 3/1 and three of a kind will pay 20/1. These bets are in addition to the main game and so will be paid whatever the outcome of the main blackjack game.